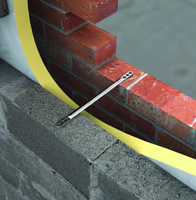 Wall ties are required in brickwork and masonry to provide structural stability and to resist wind loads. Halfen’s HTS brickwork restraint ties are available in a range of standard designs and lengths to suit most applications. All ties are manufactured from corrosion resistant stainless steel. Available in lengths from 200mm to 300mm to suit cavities from 50mm to 175mm. Channel ties to suit cast-in or surface fixed Halfen channel. These ties can be used to restrain masonry back to a new reinforced concrete structure using Halfen HTA-CE 28/15 cast-in channel or Halfen Ribslot (Dovetail) self anchoring cast-in channel. 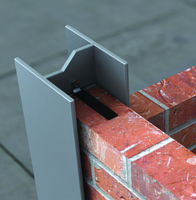 Alternatively the brickwork can be secured back to steelwork or an existing concrete or masonry structure via surface fixed Halfen HM 28/15 plain back or HL 28/15 slotted channel. Available in lengths from 100mm to 250mm to suit cavities from 20mm to 187mm. 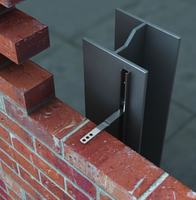 These frame cramps can be used to restrain masonry back to new structural steel or existing concrete, steel or masonry structures. These ties are used to provide restraint in one direction whilst allowing the brickwork to move longitudinally. 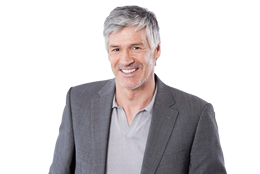 The frame cramps can be fixed back to a new structural steel or existing concrete, steel or masonry structures. Available in lengths from 75mm to 200mm to suit cavities from 0mm to 137mm. 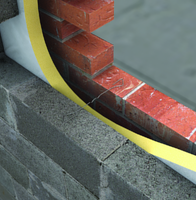 These de-bonded ties are used across movement joints in brickwork or blockwork. 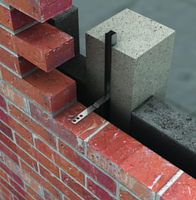 They provide shear capacity for the wall whilst allowing the brickwork to move longitudinally. 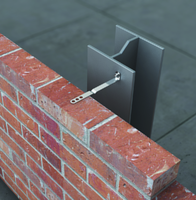 Tested as Type 2 (strength) to BS EN 845-1 this tie is used to connect two skins of masonry together, usually blockwork and brickwork. Available in 200mm, 225mm and 250mm lengths to suit cavities from 50mm to 125mm. 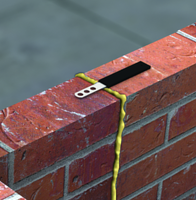 Tested as Type 4 (strength) to BS EN 845-1 this tie is used to connect two skins of masonry together, usually blockwork and brickwork. Available in lengths from 200mm to 275mm to suit cavities from 50mm to 150mm.